Sunflower Swifts produce nostepinnes that are hand turned to order - each one is unique. They are available in Walnut, Beech, Olive, Ash, Oak and Cherry. They are used to wind up your beautiful skeins to produce yarn cakes or balls. 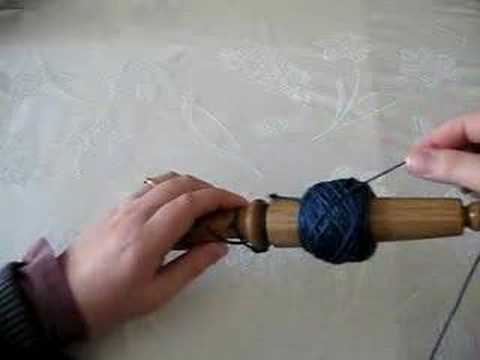 The nostepinnes are more portable than a ball winder and swift and easy to use. The price include shipping directly from Sunflower Swifts to the UK. If you would like shipping to Europe or the U.S.A/Worldwide, the cost will be £23. As each item is produced to order, we will contact you with an indication of the likely delivery date, or you can contact us before placing an order. Brilliant solution to Cat chasing wool problem! My new cat thinks my knitting needs to be killed, and the moving of hand-wound balls of wool is particularly exciting for her. I found centre-pull balls easier to keep away from her and so I was looking for a way to hand-wind my own when needed. This lovely device, so simple and delightful to use, is the answer and makes hand-winding skeins much easier and pleasanter. The result is a perfect squishy ball of centre-pull. I highly recommend it, it's worth the money.